The iPod is one of the most popular MP3 players. As such, many companies have produced docking stations to allow you to listen to the music on your iPod on speakers rather than headphones. If you have a SanDisk, you will be glad to know that many iPod docking stations include an audio jack in the back that allows you to connect the SanDisk MP3 player to the iPod docking station. Insert one end of the 3.5mm audio cable into the headphone jack on the SanDisk Sansa MP3 player. Insert the other end of the audio cable into the audio input jack on the back of the docking station. This jack may also be in the front of the docking station, depending upon the model you have. The jack port is similar to the headphone jack on your SanDisk MP3 player and should not be hard to find. Turn on the SanDisk MP3 player, and then turn up the volume to almost maximum volume level. Press play on the SanDisk and listen to the music as if you had it connected to headphones. You may have to adjust the controls on the docking station itself, depending upon what type you have. 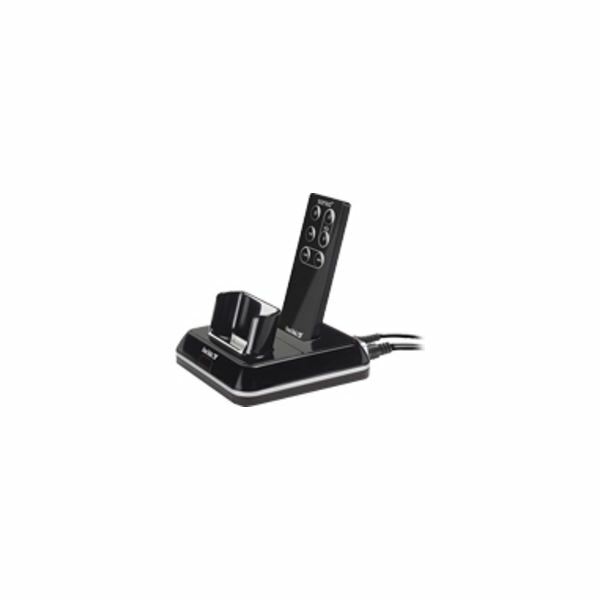 Some docking station remote controls will not control devices if they are hooked up through audio inputs. A SanDisk works great on an iPod Docking Station, and once it is connected, it sounds the same as if it were an iPod. The only problem you may find is sometimes the remote to the docking station will not work if the SanDisk is hooked up through the audio inputs. The controls on the docking station will work, however, just not the remote control that is made to control an iPod when it is connected to the docking station. This is something you may want to ask before you purchase a docking station for your SanDisk if this is important to you. Some iPod docking stations will not work with the Sansa at all. Apple uses a specific connection method that supports only other iPod devices. When you purchase a docking station, you need to ask if it will support a SanDisk Sansa MP3 player. Below are listed some docking stations you can use that are made specifically for the Sansa, andyou will not have any problems using with your Sansa MP3 player. Not all iPod docking stations have an audio input jack. If the docking station you're using doesn't have one, you won't be able to use it on the docking station, as it won't have the same connection as the iPod. When your Sansa MP3 player is connected to an iPod docking station, it will not charge. You will need to charge the MP3 player in a wall charger to ensure long lasting playback while connected to the iPod docking station. 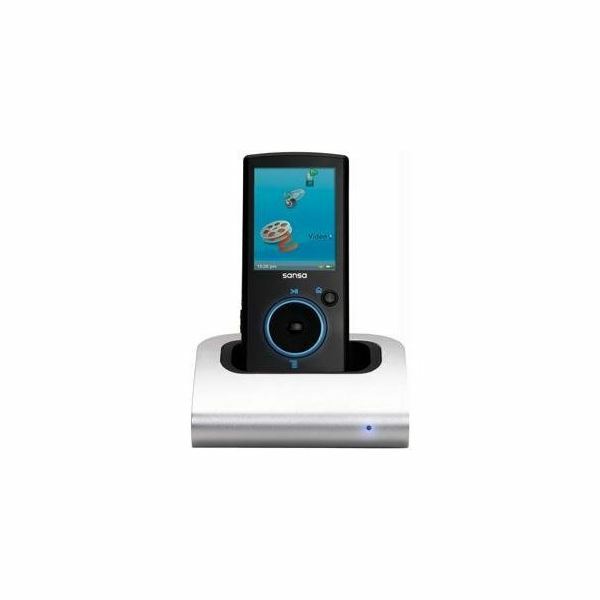 This docking station works with any dockable Sansa MP3 player. The LED changes color to indicate when the player has finished charging. It also incluces a high quality USB mini to USB A cable, and an audio out jack so you can connect the Sansa to a stereo. It has a line out so you are able to listen to your music over the speakers. The Sansa Base Station charges your Sansa MP3 player and transfers music. It uses a remote control so you can control your MP3 player from a distance. It has connectors on the back of the base station with IR interface on the front. It is comapatible with SanDisk Sansa e200, and SanDisk Sansa c200 MP3 players. According to SanDisk, there are known problems with iPod docking stations that have remote control devices. If you are going to purchase an iPod docking station for your Sansa, you may want to purchase one that does not use a remote control to ensure it is going to work properly.. Remember, your SanDisk will only work in an iPod dock if it has an audio input jack. Not all iPod docking stations have this input jack, so you need to make sure there is one on the docking station before you purchase it. Obviously, you will not be able to simply sit your Sansa where the iPod sits, you will have to connect it through this audio input jack.